Travel via NYC Ferry to Court 16’s Pickleball Clinics. Take NYC Ferry’s Astoria or Lower East Side (LES) route to Long Island City, Queens to enjoy this social event. Organized free-play and an introduction to the rules and strategy of the game! This paddle and wiffle ball sport is perfect for players of all levels, Pickleball combines elements of tennis, badminton, and ping pong to create a sport that is perfect for players of all levels. This is ideal for Networking Events, Social Gatherings, and Competitive Tournaments. 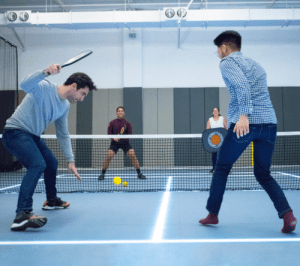 Court 16 remix the game of Pickleball on the first-ever LED tennis courts in the country at our Long Island City location. Every other week, Court 16 will host Pickleball clinics to introduce the game to the community!